We have changed the way we link up with you. We use Facebook) much more. Our e-newsflash, and One Voice are now notified to you via Facebook. Please add us to your favorites; please look at our Facebook page often; please contribute; tell us what you like or want improved; click on LIKE whenever possible. Comment about isastutter Facebook page on your own Facebook page and ask your readers to visit and LIKE us! Tell us how we can help you or your local group. Let us know if you have any ideas about how to improve our Facebook use. In recent months, the ISA has been reaching out to more PWS and SLPs/SLTs around the world. We have some momentum building up. We wish to keep and increase this momentum in order to help more PWS. In the ‘Help we Need’ section below I hope you find a task you can help us with and make 2015 a very memorable year for your ISA. As mentioned above we have begun to pick up momentum and we want to continue this momentum and hope we can increase the speed so we can help more needy PWS in more under-served countries. The tasks we need help with can be limited to sending pre-written emails to a specific list of email addresses (so good access to a computer with a good firewall and anti-virus program). This will take only a few minutes, not more than 30 minutes, each week once a pattern is established. Concentrate on up to 10 African Countries each. A mixture of any of the above tasks. Do you have experience in managing websites and the interest to gain more experience helping the ISA to upgrade our website? Would you like to join the ISA web-team? Do you have experience in fundraising and the interest to gain more experience in helping our fundraising team to raise money for future planned projects? Would you like to offer your name in July 2016 to get experience on the ISA Board of Directors? If you need more information on any of the above six opportunities to develop your CV, please contact me at keithmaxkb@yahoo.com. Some of the recent contacts we have in Africa are Mali, Ghana, Togo, Botswana, Morocco. These have been with people requesting help and/or letters sent to Universities. We have also been in contact with SLTs/SLPs working in Africa. More information will be available as work progresses. 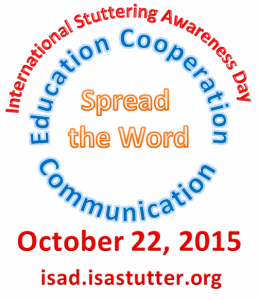 The International Stuttering Awareness Day Online Conference team, led by Bruce Imhoff (Australia), have started working on ISAD 2015. I expect something detailed from Bruce early in May. In the interim, I would remind you we will need papers / videos / experts. The team is finalizing details around the theme. Communication skills day by day, thus reducing the burden of stuttering to enable people who stutter to live and thrive as assets to their community and nation. Look for more details in May on our Facebook page. I am very pleased to announce that the Board of Directors have appointed two new Directors. Annie Bradberry and Hanan Hurwitz. Many of you will know Annie (USA) from her work with NSA, her presence on the ISA Advisory Board and her brief time on the ISA Board of Directors around 2007/2008. Annie has a variety of skills, which will be useful to the ISA with the planned expansion of Outreach work. Hanan (Israel) has proved his skills in recent months in his work on Outreach Project Africa. He is an active participant in a variety of discussions going on at the moment about ISAD / website / Vision / Mission / etc. We are fortunate he is able to spare time to spend on ISA work. He recently visited Taiwan and spoke with a class of SLPs at Taipei City University, as well as a local self-help group. This is more active outreach in Asia! Currently, we now have nine Board Directors. This is the maximum our Constitution allows. Our Treasurer will soon be sending out reminders for those associations who have unpaid 2014 invoices.If you need help, please contact our Treasurer Árni at <arniheimiringimundarson@yahoo.com> . We need your thoughts on what you want to see in the ISA website. We are looking for ideas on content. 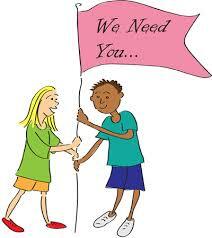 (We also need extra volunteers to join our web team). Do you want to test drive our Test website and comment on it based on your website experience? We will be having a new Introduction page. In it will be a new Vision and new Mission. to improve Communication skills day by day, thus reducing the burden of stuttering to enable people who stutter to talk and to live and thrive as assets to their community and nation. Mission: The ISA improves the conditions of all those whose lives are burdened by stuttering in all countries; propagates ways to prevent stuttering becoming a continuous burden, especially in children; increases our active outreach; encourages use of universities, websites, associations, self-help organizations and social media; encourages use of the internet for all kinds of meetings including therapy, self-help and exchanging ideas by verbal communication, talking. What do you think about these new statements? No change from the information in February. We are looking at dates around July 1st – 5th 2016. It will be in Atlanta GA near the East Coast. A hotel has been arranged. The Hyatt Regency on Peachtree Avenue. More as soon as possible. During the debate the Board held on Vision and Mission, it was emphasized that people who stutter are under no obligation to seek therapy or to improve their communication skills if they are comfortable with their current abilities. “CONVENTION ON THE RIGHTS OF PERSONS WITH DISABILITIES”. An ASEA video on stuttering. It is time to reflect on those individuals who give so much of their time, expertise, and dedication to the stuttering community. Please consider the following IFA Awards outlined below for those people deserving of recognition and appreciation. High standards of care within the context of limited resources or other constraints. Nominations will be supported by narratives from clients/families and speech and language clinicians (i.e., peers). Led to fresh approaches to working with people with fluency disorders and/or their families. Nominations will be supported by a description of the specific innovation or development and may be submitted by professional work colleagues and clients/families. Supporter(s) of People with Fluency Disorders Award: To recognize the efforts of an individual or group who has made a unique contribution to individuals with fluency disorders, services to the community of people with fluency disorders, and/or public awareness of fluency disorders and related services. Nominations will be supported by a description of the specific contribution and could be submitted by those working in the field of fluency disorders, people with fluency disorders and their families, self-help group members, and others from the community. Consumer Award: To recognize an individual or group of people with fluency disorders whose tireless efforts and often unique and creative activities have promoted the interests of all people with fluency disorders and their families. Nominations will be supported by a biography with reference to awareness-raising activities and could be submitted by those working in the field of fluency disorders, people with fluency disorders and their families, or self-help group members. Unsung Hero Award: To recognize the heroic actions of an individual from the community of people with fluency disorders, parent or partner of person with a fluency disorder, teacher who has supported a child with a fluency disorder, or the like. Nominations of speech and language clinicians would not be included here; the Clinician Award would be more appropriate in this instance. Nominations will be supported by a description of the specific actions that would lead to the identification as a “Hero”. Nominations are open to submission by any person from the community of people with fluency disorders. Lifetime Achievement Award (Exceptional): The Nominations and Awards Committee seeks nominations for an award in this exceptional category. This award is NOT expected to be gifted in every round of awards. This award would be given to an individual who, throughout a significant life span, has made a difference to people with fluency disorders in which the discipline itself has been influenced by and benefited from the particular contributions. The contribution should extend beyond one specific field (i.e., should not be limited to research or clinical practice). Nominations will be supported by a biography and would have the endorsement of several different persons in the community of people with fluency disorders (i.e., educators, individuals with fluency disorders, parents, clinicians, researchers, etc. ).